It was the time of Queen Victoria's "Little Wars" and the "War to End All Wars." It was also the time of Sherlock Holmes and Dr John Watson. 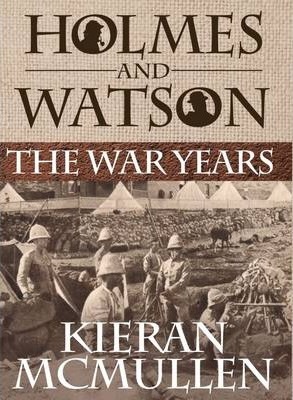 Watson, the man, would be formed by his experiences in the British "Second Afghan War," before he ever met Sherlock Holmes in an adventure, he would record this experience as Watson's Afghan Adventure, a tale of war and mystery. Later, Holmes and Watson would go on to not only share the problems of crime solving, Watson's three marriages, a purported tragedy at Reichenbach, and Holmes's return from the dead; they would also share two more wartime experiences. In Sherlock Holmes and the Mystery of the Boer Wagon, they are called on by Mycroft Holmes and the British government to go to the battleground of South Africa. Their mission is to stop the flow of army secrets to the Boers and try to recover a King's ransom in gold. By the time of their third great wartime adventure the two friends are retired, but Mycroft, and the government, need them once more as they are called on in Sherlock Holmes and the Irish Rebels. Holmes and Watson had already foiled the plans of a German espionage ring at the start of the Great War in the tale Watson called "His Last Bow." But it was not, in reality, Holmes's last bow. Holmes and Watson are sent now to the little war within a war, the killing fields of Dublin in 1916 and the Irish Rebellion. Can they stop it? And can they stop the plans of a renegade member of the Dublin Metropolitan Police? . A special hardback edition including all three bestselling Sherlock Holmes novels from Kieran McMullen.